Misty Jannat is a Bangladeshi newcomer actress and model. She is the actress who already draws the attention of the audience by her wonderful acting capacity. Misty predominately used to appear television commercial in early career life, later she emerges as a big screen actress. ‘Love Station’ is her maiden movie in the Dhallywood film industry. Misty Jannat was born in Khulna, Bangladesh and brought in this region. Her father G.M. Hossain is a teacher and the mother Shah Parvin Akter is a social worker. The parents are the music lover who helps their daughter very much in building career to the media arena. Misty was so much passionate about media arena so much and used to learn dancing, singing as well as painting. Her mother wishes, she will be a doctor that’s why she studying MBBS at Safena Medical & Dental College, Malibagh. Misty studied up to HSC in Khulna, in 2010, she comes to Dhaka. Misty Jannat kicked off the journey in the film industry with the movie ‘Love Station’ in 2014. 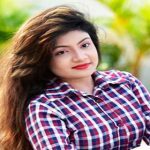 In the movie, she acted with co-actor Bappy Chowdhury and showed off a terrific acting performance in the movie eventually draws the attention of film lovers. Then she appeared in the movie Chini Bibi with co-actor Joy Chowdhury. Misty has appeared in the movie ‘Amar Prem Tumi’ with Indian superhit actor Soham Chakraborty. After coming to Dhaka the actress Misty Jannat is seen to appear in some television dramas. She starred in the drama ‘Din Ratrir Manush’ aired on Maasranga TV. Then she starred in dramas ‘Accident’, Jabbar Alir Dinkal’ and ‘Bristy Thamar Por’. Misty also performs in some television commercial at first she acted in the TVC of Venus TV. Then she appeared some popular television commercials including ‘Suresh Sarishar Tel’.